Mangaluru, Feb 28, 2015: An order has finally been issued on Feb 28, by the Regional Transport Authority (RTA) after a spell of negotiations and protests. The minimum fare is set to be Rs. 23/- (Twenty three). The agreed fares will come into effect from Sunday March 1. This meets the demands of the city Auto drivers. Further, every kilometre after the first 1.5 km will attract a charge of Rs 13 (maximum 3 adult passengers). Waiting charge will be , no chrarge for first 15 minutes; 25 percent of the meter charge for next 45 minutes of waiting. Luggage will be at 20 kg free, and Rs 2 for every extra kg or part. 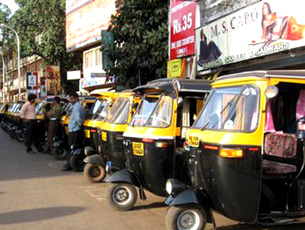 Night charge - Auto drivers can demand 1.5 times the meter charges between 10 pm and 5 am. All auto drivers are instructed to display the revised charges prominently in their vehicles behind the driver’s seat, along with the driver’s permit attached with photograph and mobile phone number. The RTA has ordered all auto drivers to install digital metres compulsorily. There has been much uncetainty of the Auto fares since January 2015. Meetings and protests were held, these new fares now have been fixed as per the demands of the Auto operators it may be noted. Auto Rickshaw Chalakara Horata Samiti leader Vishnumurthy Bhat welcomed the move and said he is yet to receive the order copy. There is still some dispute regarding the kilometer charge now said to be Rs.13/= the matter may still cause unrest.